This family was approved by DFW Adoption and the photograph tells the story of a happy family group and 3 children growing up together with their siblings. Our warm thanks to Peter and Stuart, adoptive parents, and their lovely children Rebecca, Ryan and Rihanna for allowing us to print their photo and their views. 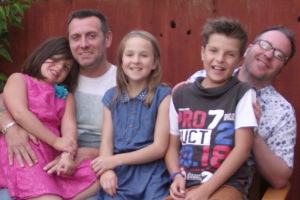 Rebecca, 10, and her younger sister Rihanna, 7, and older brother Ryan, 11, are really enjoying their new life with their new dads Peter and Stuart. Peter said: “We thought it was really important for the children to stay together, some people can be put off adopting children over five fearing that they have already developed their personalities but it isn’t like that at all. The children have very much become our children and it’s lovely to see parts of our personalities in them too. “We were nervous at first but have had lots of support, have learnt lots and made some really good friends. At the beginning we worried that the children may feel different at school for having two dads, however this has turned out to be a really positive thing for them and in fact other children have said it must be really fun and they also want two dads.